Catcher Molly Mello after tagging Cori Simons for the final out. 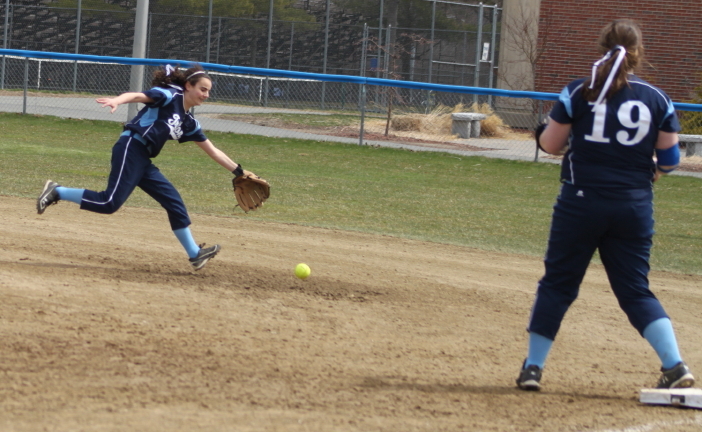 Jill Lombard (#13) hits a 2-run double over the glove of Rachel McCarthy in center in the third. (Byfield) One team had runners in scoring position with two outs in three different innings and came away with six runs. 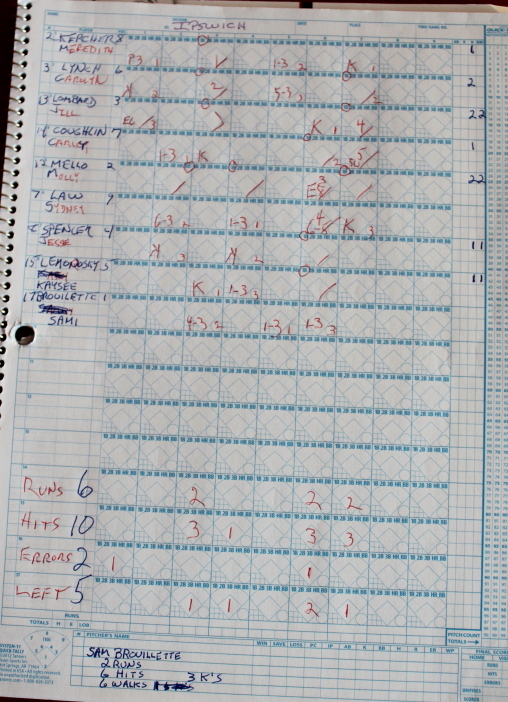 The other team had the bases loaded with one out in three different innings and came away with one run. 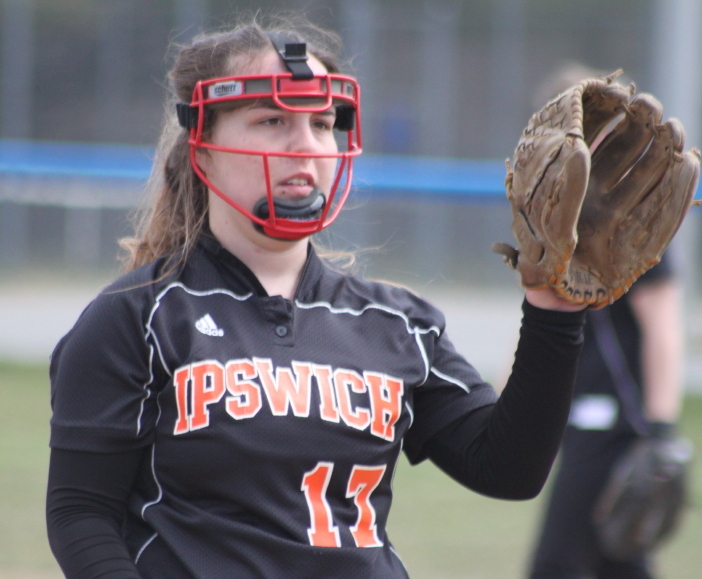 Therein lies the key data in the Ipswich Tigers, 6-2, win over the Triton Vikings on Monday morning/afternoon in non-league Cape Ann League softball action. The Tigers (1-1) collected four of their runs in the last two innings to break away from a 2-2 tie after four innings. 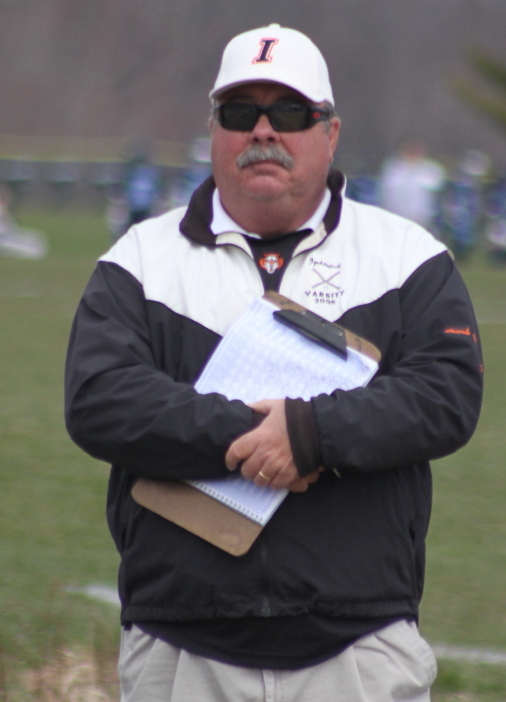 If Ipswich coach Doug Woodworth was handing out a game ball to the top performer afterwards …….good luck! A number of players were deserving for sure. 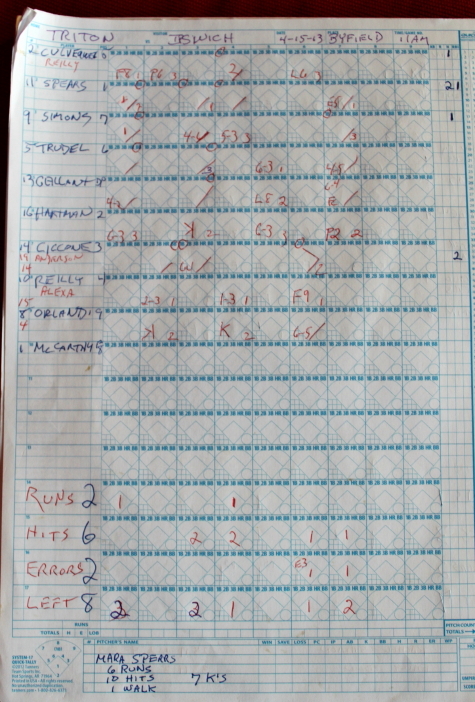 My choice, after studying the stat sheet, goes to sophomore Molly Mello just for her heroics in the seventh inning. At the bat in the seventh, it was Molly dropping a bloop single into left that brought home teammates Carolyn Lynch and Carly Coughlin with insurance runs five and six. 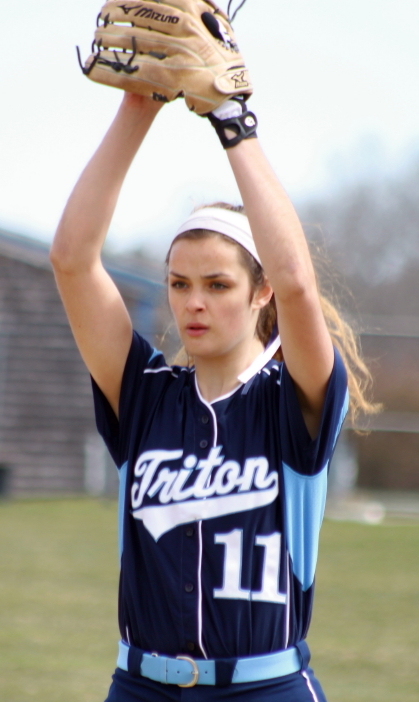 Maybe even better for Molly, and the Tigers, was what happened in Triton’s last at bats in the seventh. For the third time in the game the Vikings had the bases loaded with one out. 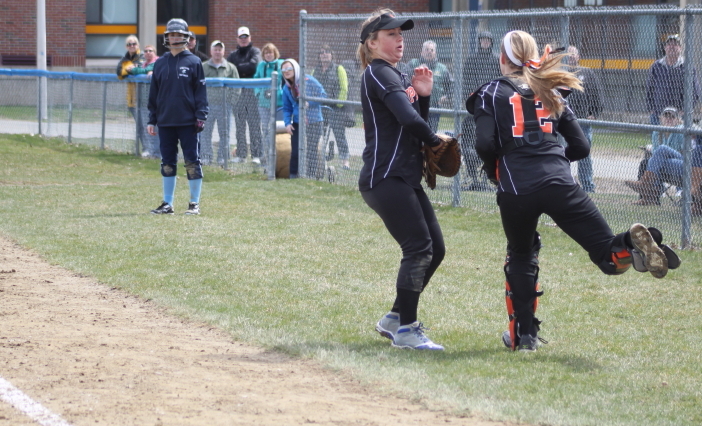 In that game-on-the-line situation, Julia Hartman hit a foul popup up the first baseline that Molly reacted to from her catching position and caught with her back to home plate. 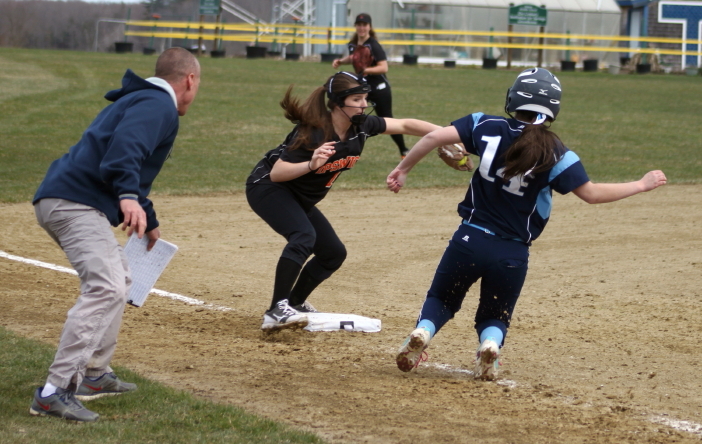 Meanwhile, Triton’s Cori Simons (on third base) saw the plate unattended and tried to score. Molly raced back to home and tagged Cori out for the final out. Senior Sami Brouillette got the win for the Tigers. Sami had control trouble early, giving up three straight walks and a wild pitch in the first inning. The Vikings came away with just one run (Cori Simons) as one runner (Mara Spears) was forced at the plate and shortstop Carolyn Lynch handled an infield grounder for the final out. Ipswich picked up their first two runs in the third. A bunt single (Meredith Kercher) and a sharp single (Carolyn Lynch) between third and short set the Tigers up in their first 2-on, 2-out situation. Jill Lombard’s blast over Rachel McCarthy’s head in center then delivered the first two Ipswich runs. Triton tied the score in the fourth inning. Freshman Rylee Culverwell singled, stole second, and scored Mara Spears RBI single to center. The Tigers picked up a pair of unearned runs in the sixth inning. 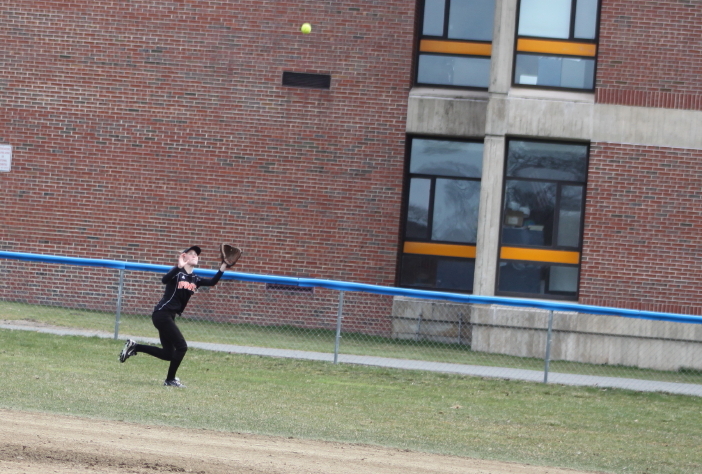 A one-out error (dropped fly ball by centerfielder Rachel McCarthy) was surrounded by a single (Carly Coughlin) on one side and two-out RBI singles (Jessie Spencer and Kaysee Lemonosky) on the other. 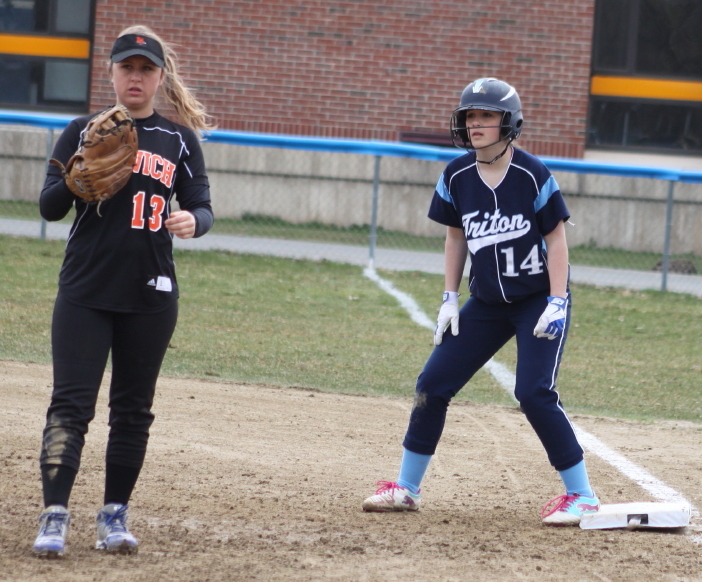 Molly Mello and Sydney Law scored the runs for Ipswich. 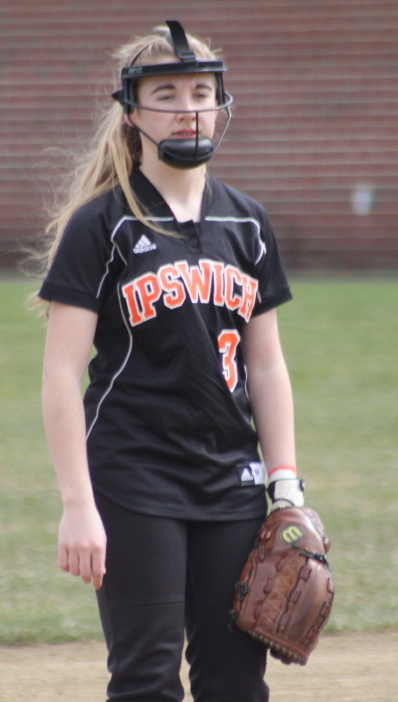 Molly Mello’s two-out hit in the seventh gave the Tigers the 4-run cushion that stayed that way to the game’s end despite a scary (for Ipswich) bottom of the seventh. Triton hurt themselves on the bases a couple of times. In the third, base-runner Kelsey Trudel interfered with shortstop Carolyn Lynch with the bases loaded for the final out. 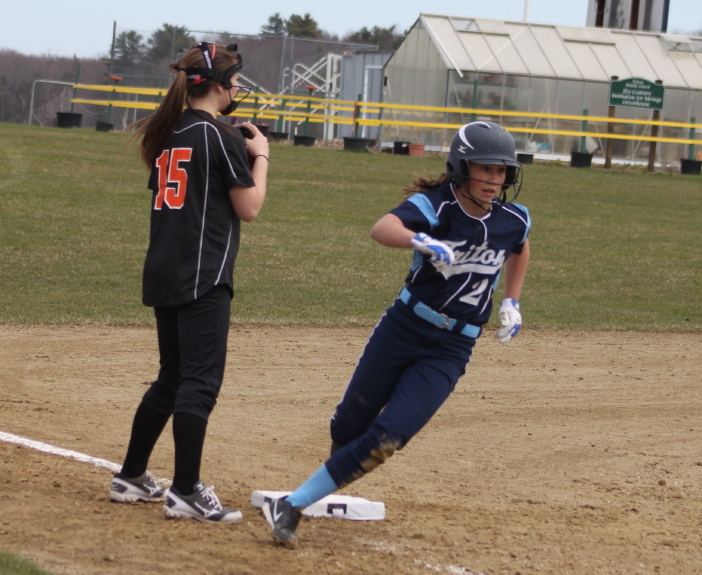 In the sixth, pinch-runner Ashley Shute was picked off third by Carolyn Lynch with one out. 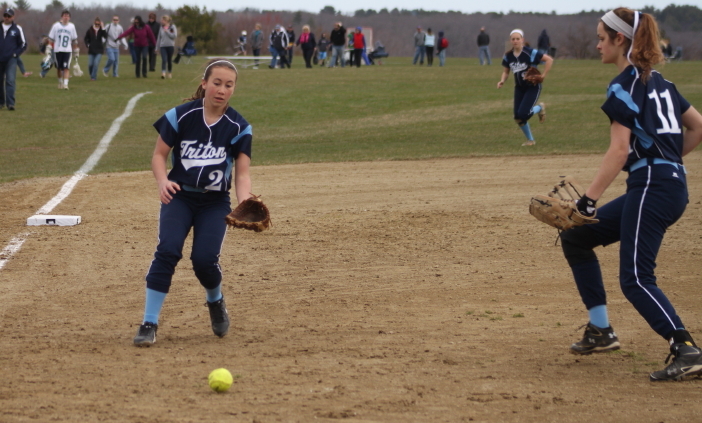 Pitcher Mara Spears and first baseman Lily Anderson each had two hits for Triton. Carolyn Lynch, Jill Lombard, and Molly Mello did the same for Ipswich. Shortstop Carolyn Lynch (2012 CAL All-Star) made a nice final-out, running catch toward the foul line in the sixth inning. 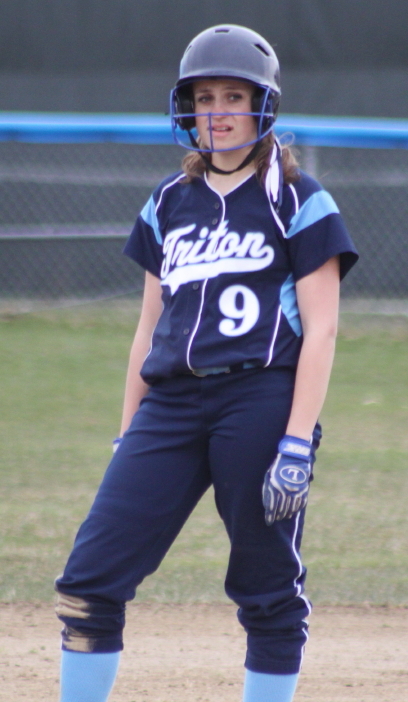 Rightfielder Sydney Law made a tough catch in the Triton sixth. Next game for Ipswich is at Georgetown at 10AM on Wednesday. Next game for Triton is at Masconomet on Wednesday at 3:45PM.